Spring weather has beckoned us to get outside and explore! Here are the best hands-on botany lessons. Nature walks are one of the best ways to get outside and really notice the type of plants around your home or school. This spring, we did a nature walk in order to classify the natural items we found around our home. 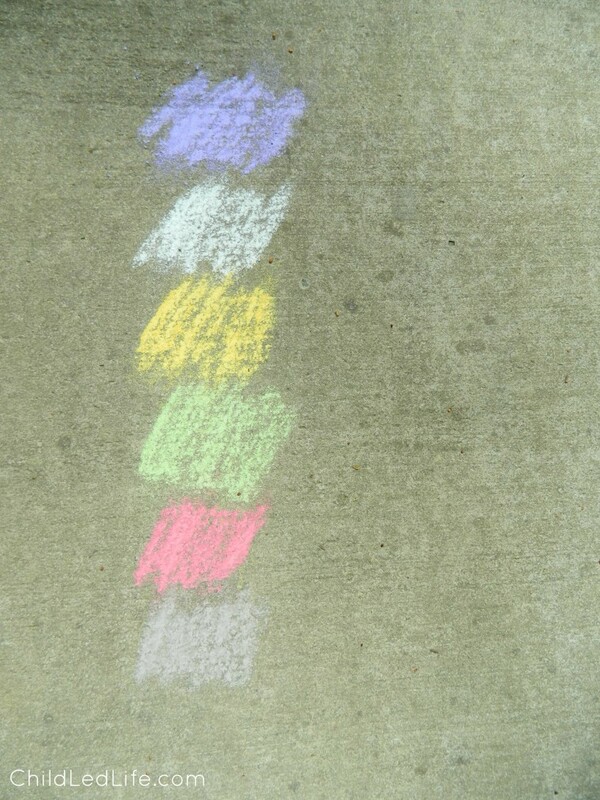 I created a rough grid on our driveway with the colors I wanted the kids to find. Then I gave them their baskets and let them explore! The kids loved classifying each of the natural materials by color! They spent a lot of time taking each piece out of their bucket, noticing the texture, then placing it in the color spaces. We like to do a nature walk each time we visit new areas of the country. It is so fun to watch your children explore a new geographical area. Try it on your summer vacation or the next time you visit the park! This set of fruit and vegetable cards are FREE on Teachers Pay Teachers. We use these often to identify fruits and vegetables we have in our home and to learn new fruits and vegetables we have not tried before. This year we used these cards as we prepared to plant our garden! You can find more about incorporating these cards into hands on art work on Natural Beach Living. 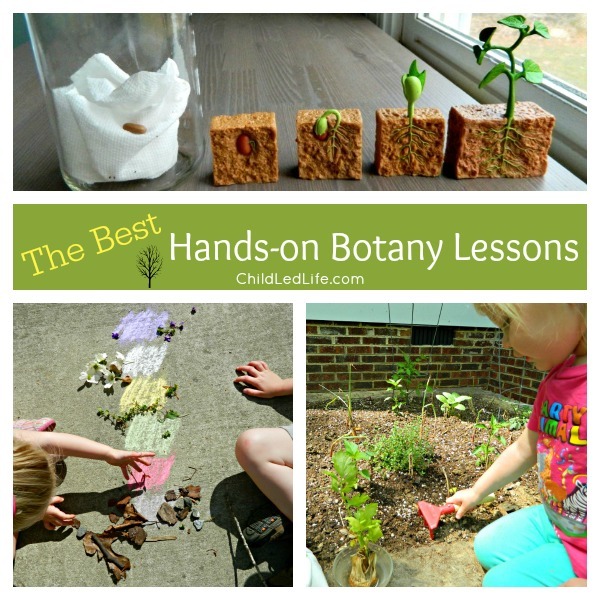 Gardening is the ultimate hands-on botany lesson! Our kids love to plant seeds, explore root systems, and talk about the necessities for plants to grow strong a healthy. You can complete a couple very fun experiments while you plant your garden this spring! 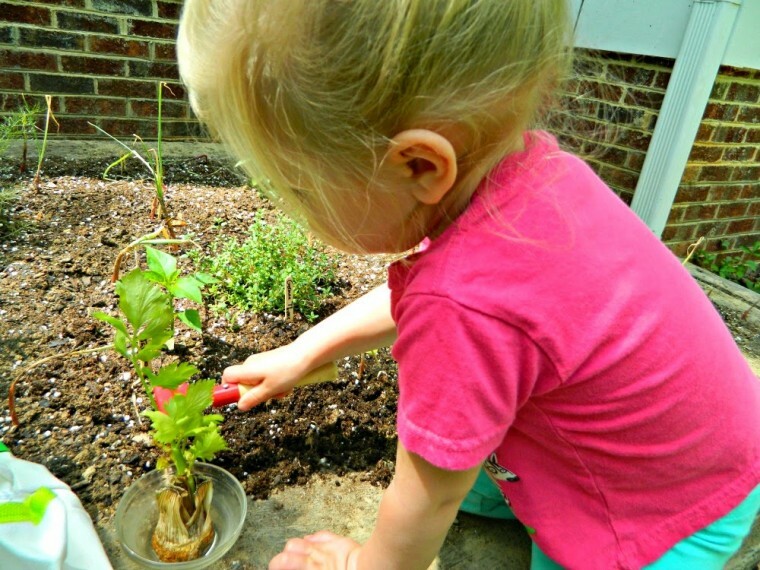 My kids started gardening very young by using recycled materials to start their first garden. Despite my own black thumb, each year we plant seeds, care of them, and watching them grow. Follow Marie @ Child Led Life’s board Gardening on Pinterest. 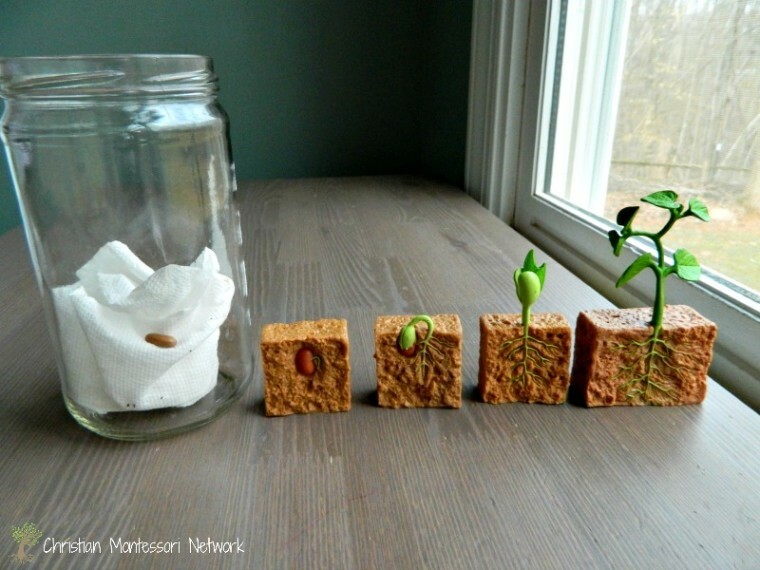 Over at Christian Montessori Network, I featured a fun hands on learning material called bean plant life cycle! These is a great material I bought from Montessori by Mom. Use the coupon code AFFMAMA and recieve $10 off your order! Samuel and Avalyn really love painting and were very intrigued with the thought of using food to paint. I took a stalk of celery and cut it to make two pieces. The kids used these pieces as stamps. 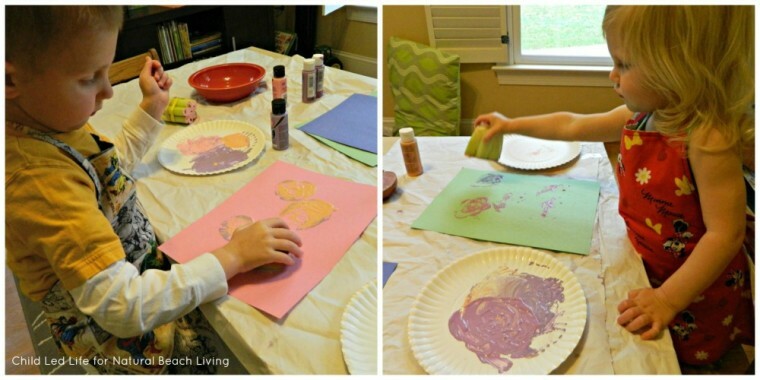 They chose the color paint and we used paper plates for easy cleanup. Then we cut an apple in half to make a heart shaped stamp. Both children loved exploring with this new hands-on painting experience! Find more on this activity at Natural Beach Living. These are great! So many wonderful ideas. (I’m always looking!) My son is up early and was glancing over my shoulder. He says, “Some of these other Montessori people have some really great ideas!” He loved the life cycle of a bean activity. Sweet post! 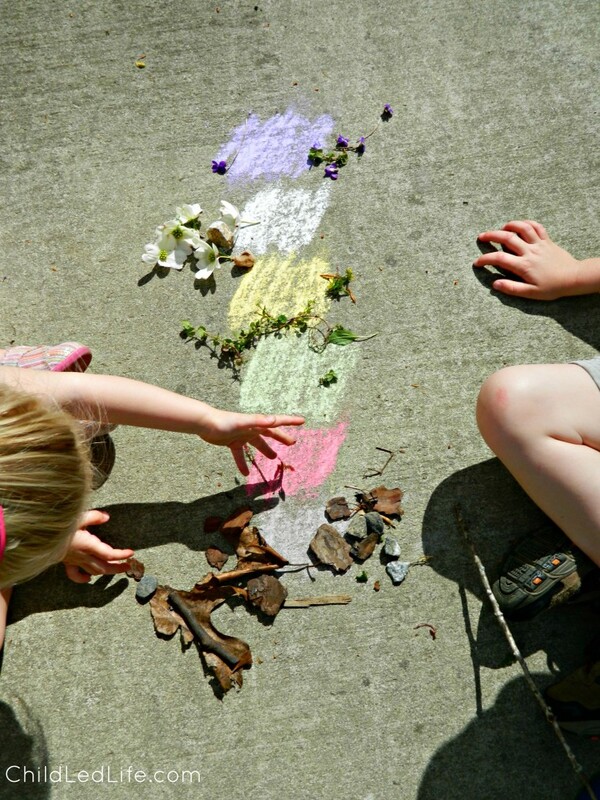 I love the colored chalk on the sidewalk and nature hunt. Fun! 🙂 Pinned! Thank you. The kids always have a good time when we are getting out and moving. Thank you for stopping by and sharing! Awesome! I love those seed replicas! 🙂 Great post! Thank you! They are such a great visual tool! Great to have you here! Wonderful! I love the coloured chalk 🙂 So creative! And that life cycle of a plant is just beautiful, wish I have one too. 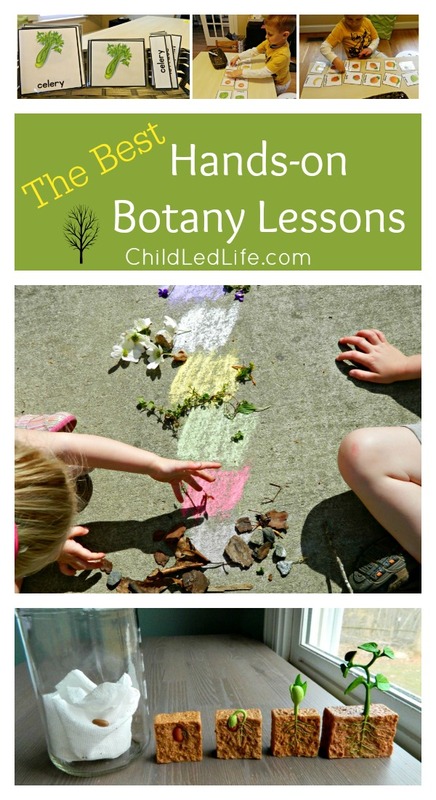 I love the idea of using chalk for outdoor color matching! We’ll have to try that one soon. Ooh, thanks for the coupon code! I’ve been curious about their kits. I have a black thumb, too… I’m hoping building a raised bed with the kids will make the difference this year! I hope so too! I hope my two kids will counter any negative vibes I bring to the garden. Good luck! Looks like you guys had a whole heap of fun. We go on a nature walk almost every day because my little girl loves to pick daisies and dandelions and berries from the trees! We have quite a few suncatchers hanging in the window showing off her finds! I love this! Such a great learning experience for the kids. Thanks for linking up to the Bloggers Brags Pinterest Party. I have pinned your post to the Bloggers Brags Pinterest Board. kareen liez’ last post was: Pura d’or Shampoo Review and Giveaway! Hands on lessons are always the best. I always loved the bean growing imperilment when I was in the school setting. The joy on the kids face when that bean started to grow was awesome. Bravo for a great lesson. Stopping by from Thoughtful Thursday.